"These Tigers and Panthers are a nuisance, very heavy armour and we have to get a side shot at them." It is two and a half weeks after D-Day and the Allies are gearing up for an ambitious offensive which aims to outflank Caen. First, a smaller operation is necessary to secure the British west flank. 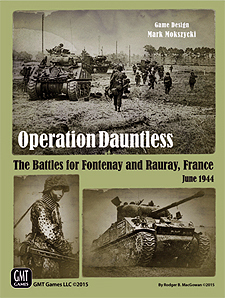 Dubbed Operation Dauntless by the British, its objective is to seize the high ground near the village of Rauray. Operation Dauntless has only 24 hours to achieve its goals before the larger offensive is launched over open ground just to the east. This is a Normandy game with no landing beaches and no U.S. or Canadian troops. The Allied effort is entirely British: the mighty Polar Bears (49th Infantry Division) and the supporting tanks of the 8th Armoured Brigade. The rolling terrain in this region features a number of open fields in addition to the scattered villages, orchards, and hedgerows typically associated with Normandy. The German defenders include elements of the 12th SS Panzer Division and the Panzer Lehr Division, two of the best-equipped German divisions on the western front at the time. The German order of battle is based on the June 1944 Ist Gliederung ("as-is-status-report") and numerous modern sources, and includes Panzer IV and Panther tanks, as well as a handful of dreaded Tigers on the prowl. The British tanks regiments include duplex-drive "swimming" Shermans and Firefly tanks armed with 17-pounder guns capable of taking on the heavy German armor. Operation Dauntless is the sequel to Red Winter (winner of the 2012 Charles S. Roberts Award for best WWII Board Wargame) and is set at an identical grand tactical scale. It uses the same core rules as the former game but adds new sub-systems and expands on existing ones, including those for armor, anti-tank fire, concealment, and aircraft. It strives to follow the mantra of simple systems giving rise to hidden depth, and is a modest step up in complexity. New chit draw mechanisms introduce a suitable level of chaos into combined arms assaults by determining the number and order of anti-tank attacks, as well as the effectiveness of infantry weapons such as PIATs and Panzerfauste. The game map is based on actual June 1944 aerial recon imagery which allowed for the precise placement of individual terrain features such as trees and houses. The oversized hexes facilitate game play by holding four 5/8 inch game counters without the need for physical stacking. Stacking limits are a convenient four units per hex for most purposes. Operation Dauntless is the first in a series of combined arms games using the Red Winter system. Learn one and you can play them all. Planned stops for the series include Guadalcanal, the Italian front, and Poland, 1939, plus revisits of Normandy and the Winter War. This game includes over a dozen scenarios, including the full three-day, 38 turn Campaign Game. several medium-length scenarios that are playable in a single session, and many shorter ones that take less than an hour to play. There are also many tutorials that introduce the rules incrementally. New players will find themselves in the action and brewing up enemy tanks in no time.